Overview: “Take on an empty stomach.” Just what does that mean? A simple prescription label can be confusing for many people, especially those with low health literacy. 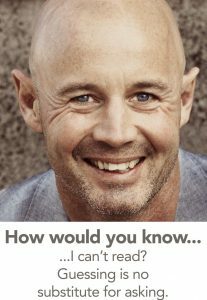 Health literacy is the ability to understand and act on basic health information. It’s also the capacity of healthcare providers to communicate clearly, educate about health and empower patients. Nearly half of all adults in the United Sates — 90 million people — have trouble understanding and using health information. 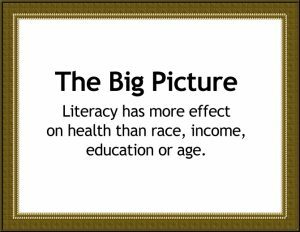 Low health literacy affects a person’s health status more than any other factor, including education, income, employment or race. People may speak English well, but still have low health literacy. Why does literacy matter to health care providers? How can I distinguish between poor literacy, poor understanding, and nonadherence in a patent? Q. Why does literacy matter to health care providers? A. Health literacy is related to overall literacy. Nearly 45 percent of Americans can’t carry out basic literacy tasks, such as identifying a specific location on a map or reading a table about blood pressure. Providers make low health literacy problems worse by using complicated medical terms when simpler words would work better. Providers can improve communication simply by listening to patients. On average, providers interrupt patients fewer than 25 seconds after they begin speaking. A. When you use “plain language,” you speak or write in a way that your audience can understand information the first time they read your writing or hear what you say. Q. How can I distinguish between poor literacy, or poor understanding, and nonadherence from a patient? A. You won’t need to, if you follow two simple steps, say literacy experts. First, after giving health care instructions, ask your patient, “Was I clear? Is there some part I should go over again?” This makes it clear that you, the provider, are responsible for making the message clear, and that your patient has a right to such clarity. Second, to check for comprehension, try a “teachback.” Say something like, “Now, just to be sure we are on the same page, why don’t you show me what you would do when …” These two steps will help assure clear communication and understanding with every patient, and not just those you think might have low health literacy. America’s Health Literacy: Why We Need Accessible Health Information summarizes key findings and presents some policy implications of the first ever National Assessment of Adult Literacy. Agency for Healthcare Research and Quality (AHRQ) Pharmacy Health Literacy Center provides pharmacists with recently released health literacy tools and other resources. Strategies to Improve Communication between Pharmacy Staff and Patients: A Training Program for Pharmacy Staff. Features informative slides and resources that pharmacies can use to hold small group discussions among staff, lead role playing scenarios, and conduct question and answer sessions. Produced by the US Agency for Healthcare Research and Quality. Quick Guide to Health Literacy: Learn what professionals can do to improve health literacy among adults from the Department of Health and Human Services Office of Disease Prevention and Health Promotion’s web site. What Did the Doctor Say? Improving Health Literacy to Protect Patient Safety: Report from the Joint Commission explains how effective communication is a cornerstone of patient safety. Federal Plain Language Guide: A federal government guide for writing “reader friendly” documents. Ten Attributes of a Health Literate Organization: A roadmap to literacy-related organizational transformation that includes related resources. AHRQ Health Literacy Universal Precautions Toolkit: A primary tool that can help primary care practices reduce the complexity of health care, increase patient understanding of health information, and enhance support for patients of all health literacy levels. UM offers free online training on culture and health literacy The Midwest Center for Life-Long Learning in Public Health offers a two-module course on health, culture and literacy. The online course discusses how inequalities in health information contribute to health disparities and what communities can do to close the gap. The course is free; all you have to do is register. Minnesota Health Literacy Partnership: Networking group that meets monthly in Saint Paul to discuss health literacy issues and programs. Publishes semi-annual issue briefs online. Minnesota Literacy Council: Statewide organization to help children and adults acquire the literacy skills they need to become successful students, workers, family members, and community citizens.